Meagan on Arkansas Mountain near Fremont Pass, CO. January 2015. I just finished perhaps my best ski season ever. Well, I finished the North American part of this ski season. Whatever more I get now is a bonus. And it finished just how it started. Meagan and I skied on the slopes of Arkansas Mountain near Leadville in mid January. And I just skied Mount Arkansas this morning. Full circle, via almost 200,000 vertical feet in six states and provinces. 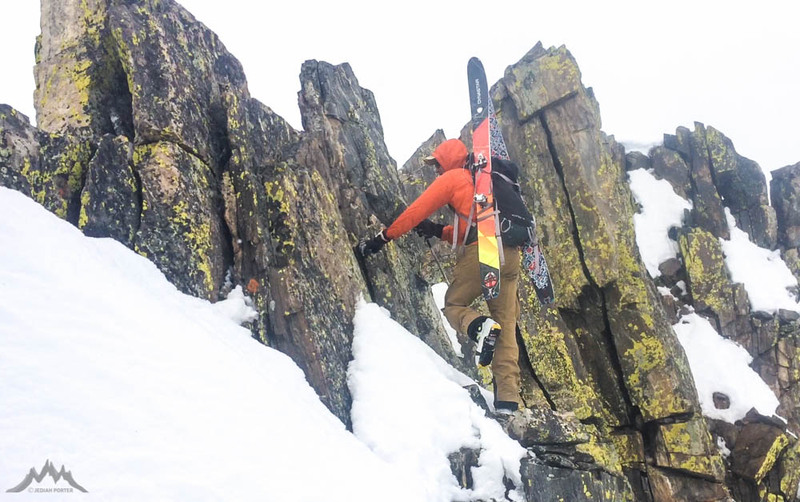 In the course of 57 days of ski touring (and four resort days), partners and myself made the most of an awful weird winter in the Mountain West. Mobility, fitness, and flexibility were key. Making the most of conditions granted sweetened the deal. I'll keep it short here. I've got words and photos elsewhere on the web. Wildsnow posted an article on the Wapta Traverse that I did with Jeff Witt. Also from Canada, my partners at Feathered Friends put up some photos and words. I've got some ski trip reporting on my site too: From the Tetons and Canada. From Glacier Circle on Rogers Pass. From the Wind River Range. Finally, I spent much of my winter testing skis and skins for OutdoorGearLab. The final results are here and here. Scrambling Selfie. Arkansas Mountain. This morning. None of this would be possible without the support of partners of all types. Clients, employers, sponsors, publishers, and regular old ski buddies all play invaluable supporting roles. And my primary travel and life buddy, my lovely wife Meagan, deserves the greatest thanks of all. To score the skiing and climbing and socializing we got this in the course of our #dirtbagwinterroadtrip we covered over 20,000 miles of North American asphalt in the often-too-close confines of our beat up Subaru. Wouldn't have it any other way.